This is a series of personal thoughts about the old hardware that we have in our hands. 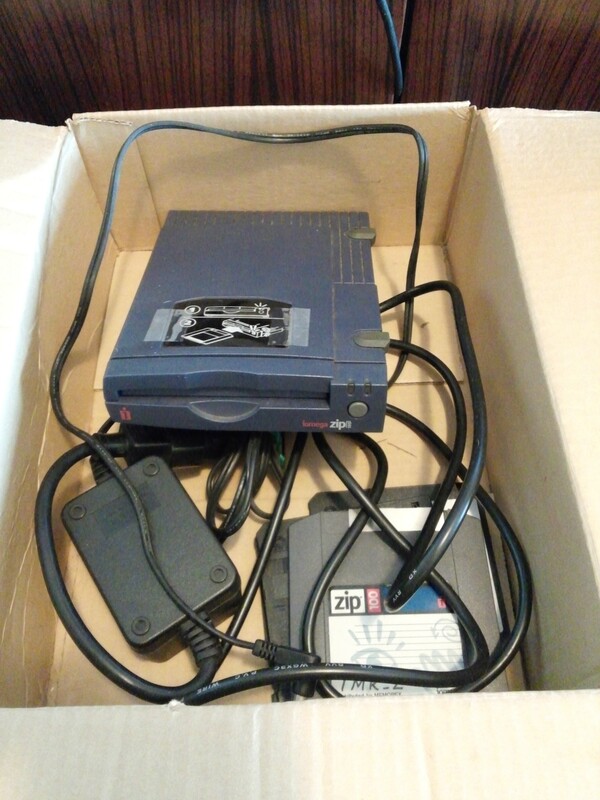 One day my professor gave me this old box ( He was cleaning up his office since he was about to leave :c ) and inside it was some ancient hardware, maybe most of you recognize Hard Drives and DVD Drives, some of the more luckier ones the Floppy Drive, but I have something even less common —– the ZIP Drive. Yes it maybe more new tech than the Floppy Drive but it is still pretty old and more rare than it. Sadly it wasn’t adopted as mainstream data storage as it was too expensive relative to other medias such as optical media ( CD, DVD ) and flash media ( USB which was real quick killer, seriously why bring a heavy power adapter and bulky zip drive when you can just insert a small 30 gram stick into the USB port). The shortcomings of the device were that they didn’t really had a standard port, some used SCSI, some parallel port, some IDE, some even had USB which was there main competitor. These were also prone to mechanical and electrical damage, the disk are easily damaged by magnetic fields and the drives are at risk of mechanical damage just like any other rotatable media. 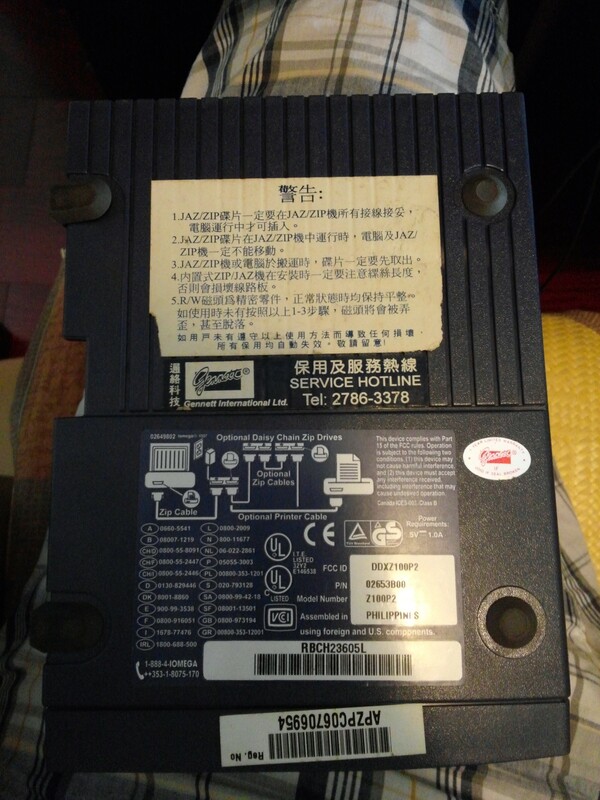 As you can see from the above photo they give you a lot of warnings about moving the drive, well it’s Chinese so here are some translations. The disk can only be inserted when the drive is connected to the computer and only after the drive and computer are powered. The computer or the drive must not be moved when in operation. The disk must be taken out when moving the drive. Be aware of the screw length when fixing the drive or else it may damage internal circuitry. The R/W head is a precision part so it must be stable at all times, if the precautions 1-3 are not taken the R/W head will be damaged or even break apart. Well that’s a lot of warnings just for moving the drive, kind of annoying so yeah I guess I prefer USB after all 😛 Well at least you can daisy chain it, Oh wait a single one of these use to cost 1500 HKD daisy chaining? sounds more like ripping you off to buy more easily broken drives. Click of death sounds nice maybe I could audio modulate it hmm…. Well I got this drive, pretty useless to me but hey we can show this to our kids or sell it to some kind of collector in the future. Nonetheless I still tried to connect it to my comp ( Yeah I have a parallel port ). Linux? YES!!!! I installed some software and drivers ( Jazip ) detected the drive nicely, sadly the disk was dead it got the click of death. Stay tuned for more hardware to come! Tesla Coil completed but having problems….